Today's Gospel, taken from Mark 1:14-20, recounts Jesus' calling Simon (Peter) and Andrew. It's a quickly unfolding story: Jesus walks by the shore, takes note of the two brothers lowering their nets into the water, and Jesus calls. They get up, apparently immediately, and follow. Just for good measure, Jesus calls a second pair of brothers - James and John - while they were mending their nets. Not a bad morning's work, I reckon: a stroll along the beach with a 'net' result of four followers. Note: if you can find a job in vocation promotion that requires only a morning stroll down the beach with the hope of getting four people to follow as disciples, then sign me up! You get the gist: the offer of $5,000,000 from a person unknown should give one pause before acting. It'd be a different story if someone called and said your grandmother, or the neighbor whose driveway you've shoveled for years, had left you a hearty inheritance. In the latter cases, it's at least believable because of a pre-existing relationship with the other person. Which is why, I believe, today's Gospel doesn't mark the start of Jesus' ministry so much as the end of its quiet phase. 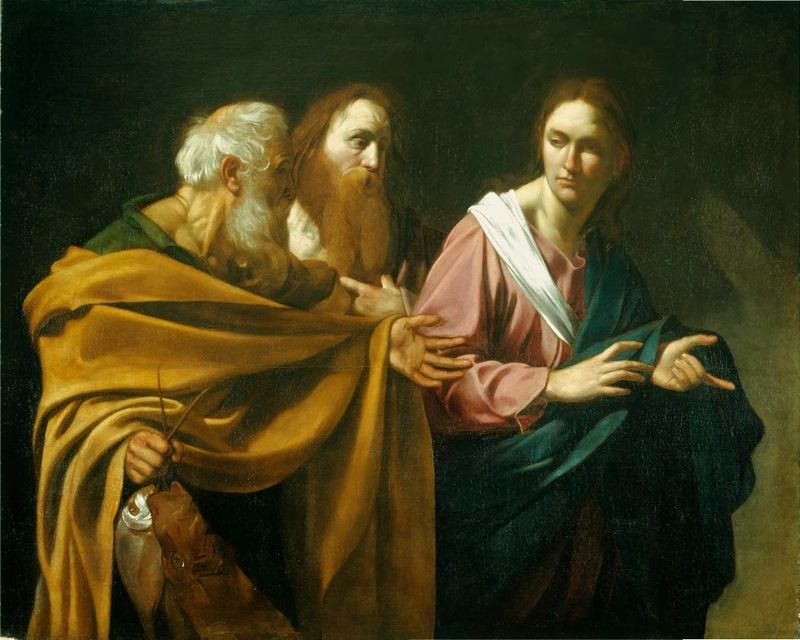 In my imagination, at least, I think it plausible that Jesus had met Peter and Andrew, James and John, before. Perhaps many times before: on journeys to Jerusalem, while gathering water or wood, while the mothers prepared the evening meal. Perhaps a small group of young men shared with one another their hopes and dreams and fears for the future. Caravaggio (c. 1602) "The Calling of Sts Peter and Andrew"
It is not, of course, that either this geographic region or its population were so vast that it'd be unlikely for their paths to have crossed. Even if they had never before met in person, it would seem likely that people would have heard of Jesus: the Gospels give us the first recorded instance of Jesus proclaiming the Kingdom; they do not claim that it was the first time he ever mentioned it. Indeed, perhaps it was within the company of his young friends that the young Jesus daydreamed of just what this Kingdom might be, of how it might look. Sometimes, I think, it's tempting to believe that we will know what we are called to do, or who were are called to be, in a momentary flash of insight. I wish this were the case! I wish it were such that one a single day everything were made clear and the path laid out with defined markers. Alas, this is seldom, if it is ever, the case. I think it more in keeping with experience that our sense of calling builds up over time. It may start with a rogue idea, a fanciful daydream, but one that lingers longer than usual. One's sense of calling may come from one's loved one's or friends who notice within a person something special, something as-yet unseen, but something in need of being coaxed out and nurtured. One's call never comes in a single booming voice. Instead, it is mediated through the voices of those around us who summon us to be the person we are called to be. This is my long-winded way of saying that I wish I knew Peter's backstory. Was he friends with the youthful Jesus? Was his heart stirred by Jesus' words and dreams? Were Jesus' other friends similarly moved and drawn to share in his vision for what the world might become? On that morning on a beach in Galilee, was Jesus' call a bolt from the blue or was it, as I suggested earlier, a decisive moment when Jesus' friends committed themselves fully to dreams and plans hatched during idyl evening conversations? I often muse on the fact that I am a Jesuit, not because on a single day it came to me to be such, but because for many years I had been coming to know this Jesus fellow - introduced through the Church and the diocesan priests, Jesuits, and religious sisters I knew - and slowly realized that in him I could find happiness. The years of relationship building, years of coming to know and to trust, were finally galvanized one day when I did hear a call deep within my heart. My "yes" on that day, and my daily "yes" I often struggle to utter, was less a crazy "leap" than it was an entering into a new phase of relationship. Prayer and discernment never forced me to live a new life. Instead, prayer and discernment have afforded me a way of living life differently and the way of Companionship with Jesus has made all the difference.